Around 1999 we, Freaknet Medialab, at the time located at the CSA Auro squat in Catania, decided to make a little GNU/Linux distribution, specifically tailored for old computers (well, those which were already old back in 1999 🙂 ). So,we put together a little and light distro, for very slow and old computers, with some add-ons and tools we thought useful for retrocomputing. During our work for a data recovery project last week (we will talk about that in a forthcoming article 😉 ) we were struggling to install the right kernel into a special linux box, adding the correct set of system modules and fine-tuning everything, checking kernel options etc. After hours of madness, mainly due to the current Linux kernel having become too fat in the last 20 years or so, we remembered our old Freakware distro, thinking that it would have been just perfect for the task. 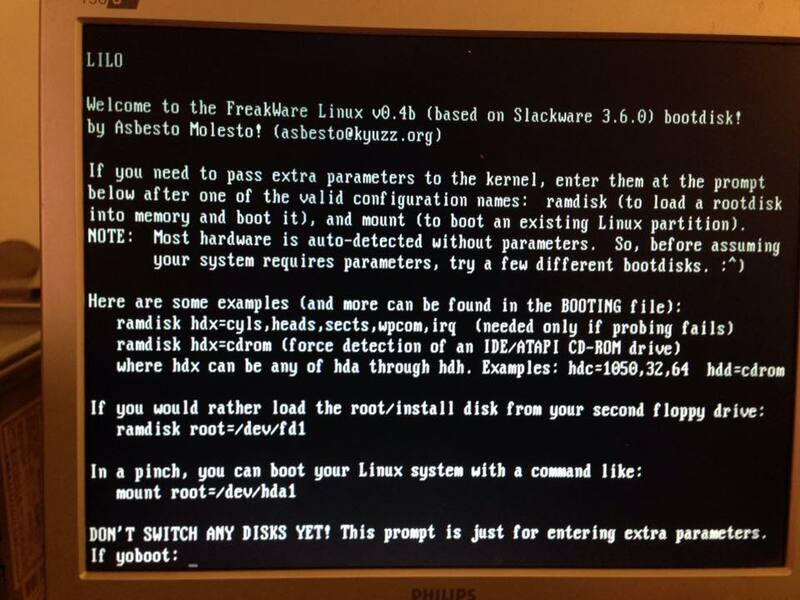 So we decided to give it a try and check if everything that was working in 1999 was today literally fucked up in the new kernel madness. We found the Freakware CD in our archives. The first tests revealed some problems: the CDROM was full of data – too much data, in fact some files were left out of the ISO image, and were actually missing. We recovered the missing files from a Slackware 3.6 mirror, we made up some additional space in the cdrom by compressing “Appunti Linux”, and replaced the corrupted files as needed. There’s a little confusion about versions: the installation screen says 0.4beta; the “leggimi.freakware” readme says 0.5beta, and the CDROM itself is labeled 0.6beta! Since this is a piece of history of Freaknet Medialab, we decided to not correct those mistakes, and to release the CDROM ISO just as it is, only with the corrections we made to fix the few problems we found. The CDROM ISO image is downloadable here. NOTE: the CDROM does not boot by itself! You must create 2 boot floppy disks, one with the “bare.i” kernel image and the other with the “color.gz” disk image that you find in the CDROM. You use those to boot the kernel and to load the installer, and then you will be able to install the system files from the cdrom. Just read the documentation and follow the instructions. The hard disk must be partitioned by hand – also the X-Windows system must be configured by hand.